Mike and Kate Westbrook, adventurous and much admired jazz artists from the UK will have a new album “Serpent Hit” out in the autumn, to be launched with a concert at Wilson’s Music Hall, London on October 1. 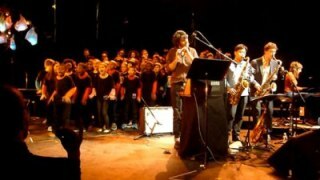 An absolutely brilliant concert at the Banlieues Bleues Festival in the Paris area made us discover the jazz saxophone player Sylvain Rifflet’s extraordinary interpretations of the legendary Moondog’s repertoire with his American partner Jon Irabagon, a group of 5 musicians and a choir of about 100 young singers. The Brasilian artist/composer Pierre Aderne will be opening for Melody Gardot at the prestigious Paris Olympia tonight and at two later dates. Aderne has been collaborating with jazz singers Melody Gardot and Madeleine Peyroux, amongst others, for his compositions and recordings.